Email certification and reputation monitoring company Return Path this morning announced that it has acquired OtherInbox, which helps users regain control over their email inbox. OtherInbox is and will remain based in Austin, Texas, as a wholly-owned Return Path subsidiary with CEO Joshua Baer still at the helm. We’re very familiar with OtherInbox around here – the company was a finalist in the TechCrunch 50 conference we organized back in 2008. 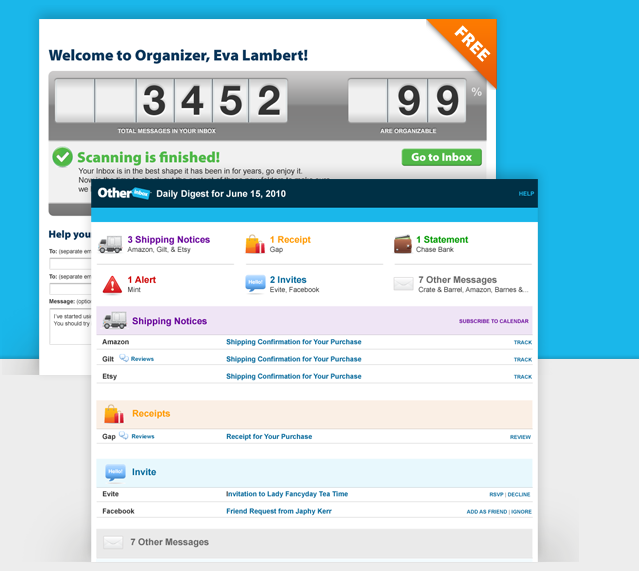 OtherInbox works with email providers like Yahoo and Google (Gmail) and helps user take back control over their inbox by automatically organizing emails from ecommerce sites, social networking services and whatnot, thus significantly reducing unwanted email. The company says it has helped organize more than 2 million mailboxes and billions of email messages to date. Part of the reason Return Path acquired OtherInbox is to enhance its Sender Score reputation scoring system, which companies use to make better blocking and filtering decisions, and also to boost its Certification program based on OtherInbox data. Financial terms of the acquisition were not disclosed; all OtherInbox employees will be making the move to Return Path but their office will remain in Austin, Texas. The company had raised nearly $4 million in funding from 500 Startups and angel investors.